This is a game I never played back in the day, but it was at the top of my list of games I need to play, so I did. And I am now scarred for life. The brutal punishment this game will put you through will make you question life itself. And, you will hate birds forever. Let’s get into it. 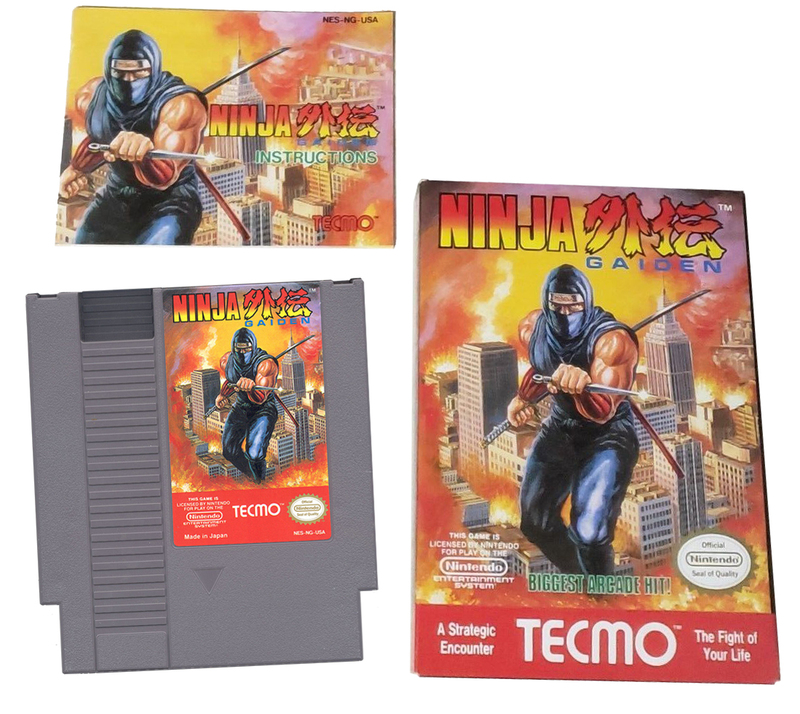 In Ninja Gaiden for the Nintendo Entertainment System you take on the role of Ryu Hayabusa, a katana wielding ninja seeking revenge for his father’s death. You will fight you way through 6 different Acts with several areas within each act and a boss guarding the end. From the time you insert the cartridge and press the power button you will be told the story of Ryu through awesome cinematic cut scenes. I believe this was one of, if not the first console games to use this anime style storytelling. In-between each level the story unfolds in beautiful fashion. Heroines, villans and plot twists await. But we’re not here for the story, we’re here to do ninja stuff! 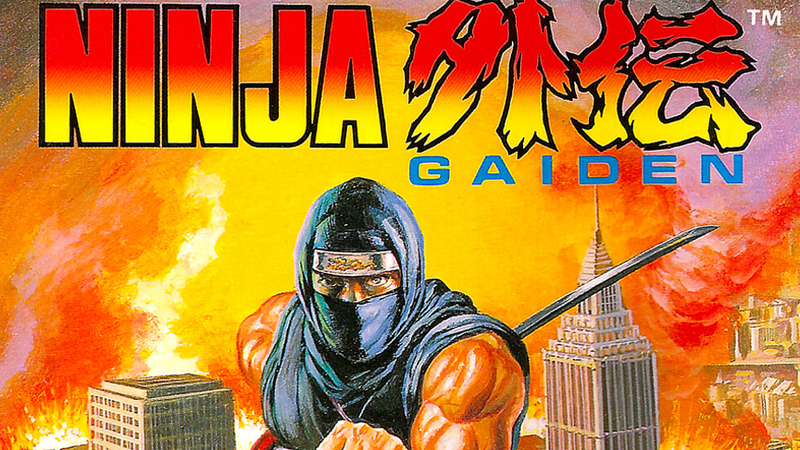 And Ninja Gaiden definitely delivers on that front. 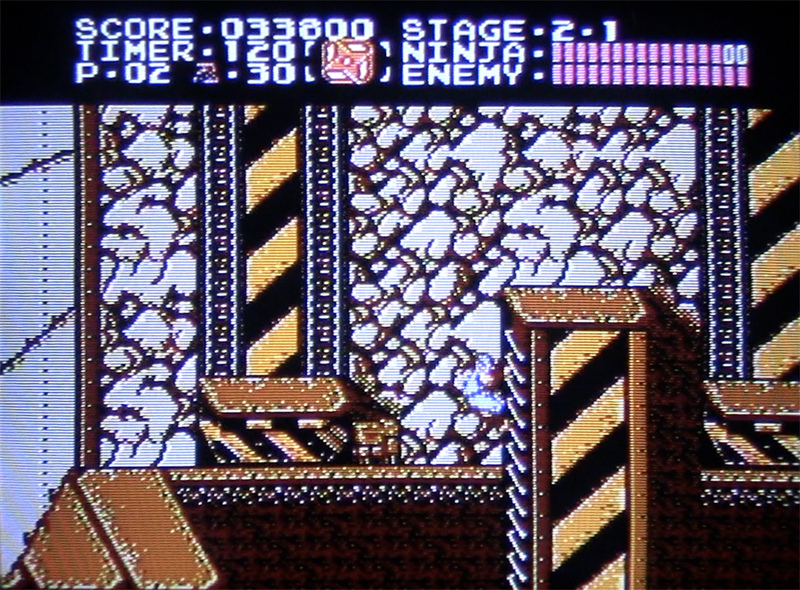 At its most basic level Ninja Gaiden is a side-scrolling platform game. In this game you want to constantly be on the move. Enemies respawn almost as soon as you kill them. You will never clear the screen of enemies and be able to stop and take in the scenery. You must stay on the move, slashing and jumping your way through a never-ending wave of bad-guys who have been meticulously programmed to be in the absolute worse place for you at every step. This game really is amazing in the amount of precision and timing it will require from you to make it past even the easiest of bad guys. There are 6 acts you must defeat with a boss at the end of each. As you progress, each act will have more more sections. Act 1 has just one section, and then a boss fight, but several acts have three sections you must clear before reaching the boss(es). You have a hit points bar at the top of the screen and can take many hits before dying, but you will almost never heal. You always have your sword in hand which will kill any enemy in one strike except for the bosses. As you run through each level there are items you can destroy like lanterns, torches or humming birds (don’t ask me) that will drop pick-ups for you. The pick-ups will either be potions, or special weapons. There are four type of special weapons you can pick up: Standard Throwing Star, Boomerang Stars, Fire Balls and a Spinning Attack that kills foes if you touch them while jumping. The potions are just the “mana” you’ll need to use the special weapons. One potion drop may give you 5 “mana” or more and using a special weapon will use an amount. Some special weapons use up to 10 potions to cast. This means you will not be spamming your special attacks as they use up potions real quick. They are best saved for trouble spots in the game, of which there are an endless supply. The icon in the top middle of the screen shows you your current special weapon if you have one and your potion count is shown to the left of that. If you pick up a special weapon it will replace the one you have. In addition to the weapon pick-ups and mana potions there are potions that just give you points, and a rare one the will heal you some. You can also jump enemies and obstacles. True to platform standards there are plenty of instant death jumps you will have to make, often with several bad guys trying to take you out. 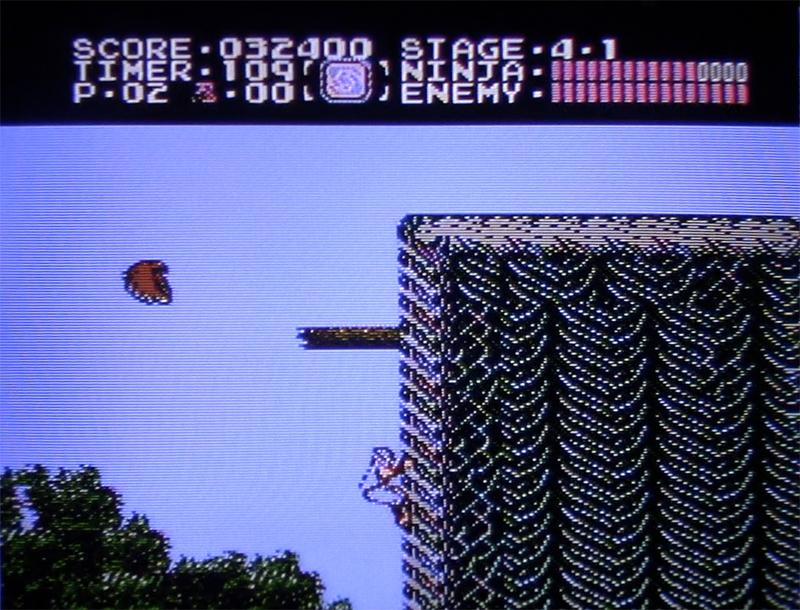 While jumping you can also cling to almost any wall and then jump off of it to reach a higher platform. You cannot climb while attached to a wall unless there is a ladder and you can’t attack when on a wall either. This can make some areas a pain as you will accidentally cling to a wall instead of doing what you wanted to do, which can often lead to death. The controls for Ninja Gaiden are pretty straightforward. The D-Pad moves you left and right. The A button jumps and the B button attacks. To use a special weapon you push Up on the D-Pad and press the B attack button. You can use your sword while jumping and often have to. The control of Ryu is spot on and quick, and it needs to be. You have to make critical jumps and attacks while on the move and fortunately the controls do not get in the way. Pushing up does nothing, but pushing down will make Ryu duck, but if you’re trying to duck something, you’ll be dead soon, so just keep moving! Once you’ve gotten good enough to complete the earlier stages without dying, the controls start to feel even better. You will traverse a level in true ninja style, hacking through enemies, leaping over them and slashing them out of the air all on the run. It’s fun… at times. 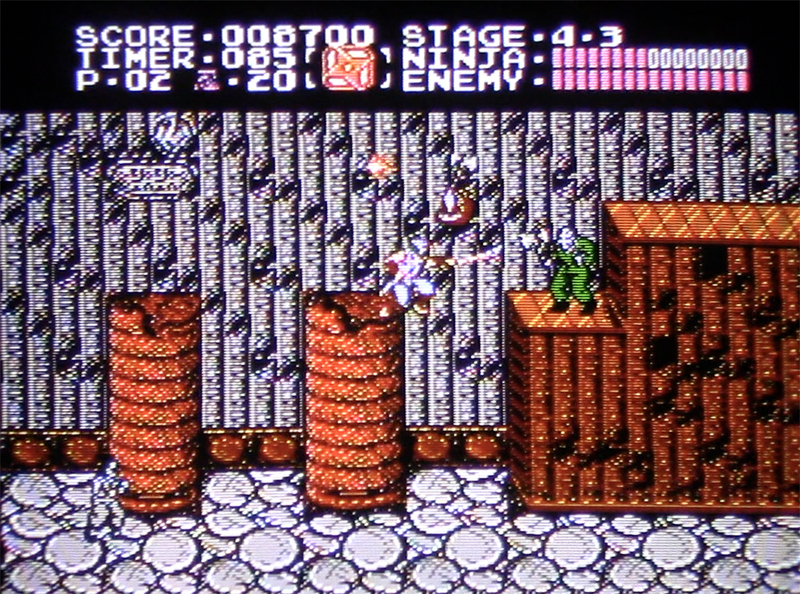 Ninja Gaiden is a good-looking game on the NES. It wont blow you away but it’s well done. Your ninja and the enemies are a little small but detailed. There’s not a lot of animation frames outside of walking and attacking for you and your foes. The Bosses are large with decent detail but again not a whole lot of animation on them. 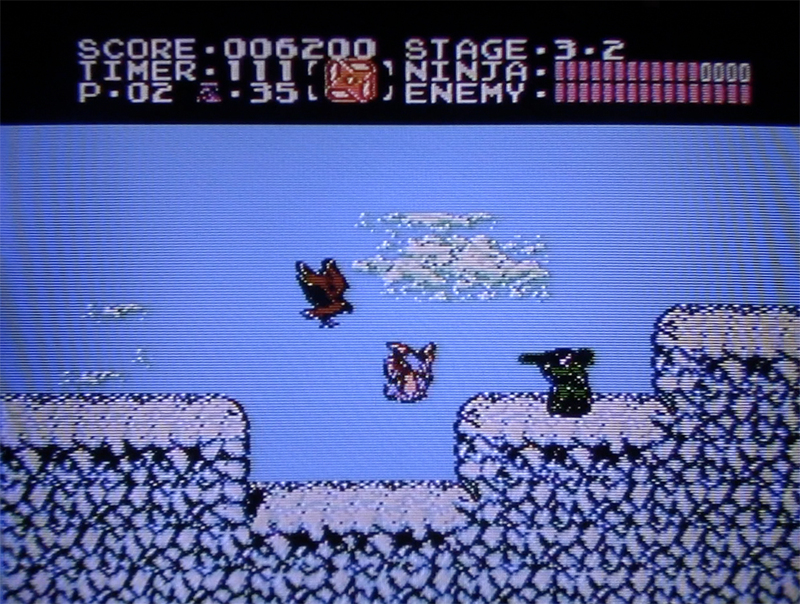 Your little ninja Ryu does look cool when he’s jumping, doing a ninja somersault, and I like the way he runs with a hand ever-ready on the sword. The backgrounds and levels are the highlight in the graphics department. There is a lot of variety and small details in every level. You will never feel like you’re running through the same section over and over. They did a good job here. Even the sub sections to each act are different and diverse. Another high point for the graphics are the cut scenes. 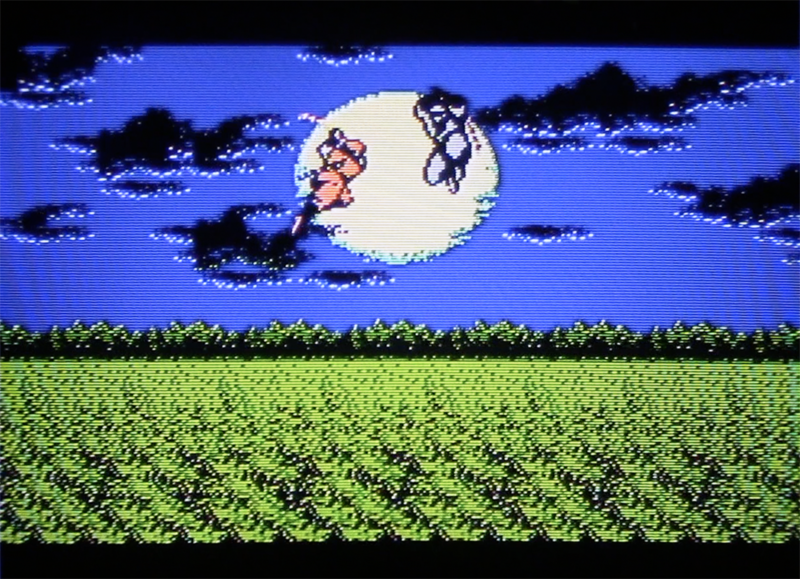 At the beginning of the game and after each level you are presented with the story using some great anime-style cut scenes. It’s a nice break before you are thrown back into the fire and action of the game. For many gamers this was the first movie like presentation for a video game they would lay eyes on. 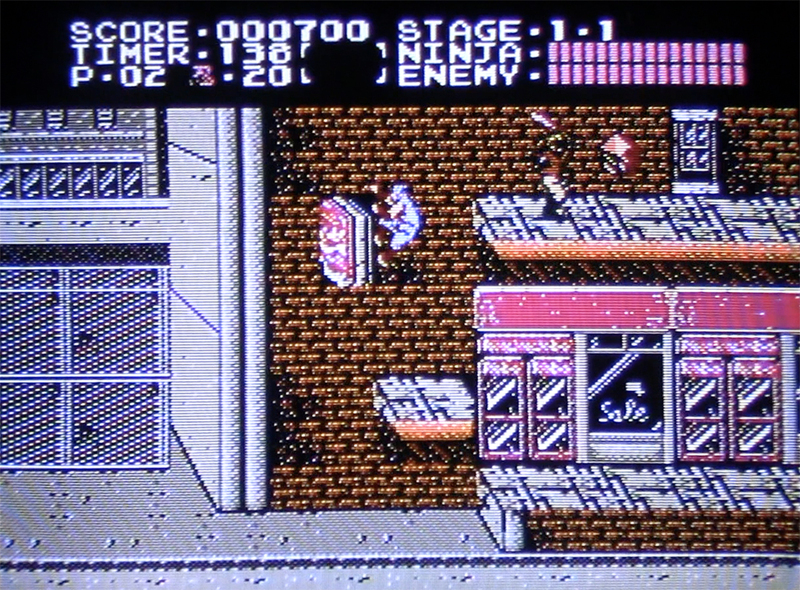 Another area where Ninja Gaiden gets a passing grade is the music. It’s some pretty good stuff considering the NES capabilities. The music is high-tempo techno that matches the frantic action of the game. The songs are repeated on different levels but spread out enough that you don’t feel like you’re hearing the same music over and over (other than having to do a level 100 times to make it through). The death screams and jump sounds are standard affair and get the job done. OK, I have played some hard games in my day, and feel I am a skilled player even in my advanced years. But this game will make a grown man cry. It can be the most brutal, teeth grinding, temple pulsing, rage inducing game you have ever played. You will breeze through level 1 in a few minutes. You’ll beat the level one boss on your first or second try. And then the game will start to get progressively harder. By the time you reach act 4 you will be taught brutal lesson after brutal lesson on how to die. At times you will stare at the screen in disbelief, amazed at what they are throwing at you, wondering how in the hell you are ever going to get past this point. And when you do, just a few feet away, is another section you will die a dozen times over again, just to advance a few more feet. Fortunately you can continue forever, there is no limit. You get three men, when they die, you can start again at the beginning of the level. And you will die, hundreds of times. It’s funny, you may make it though a section no problem, get further in the stage and then die and have to start the level over. And now that section you breezed through last time? It will kill you a dozen times in a row. And this continues all the way to the end of the game. What makes the game so hard? The enemies. They are relentless. You will learn to hate birds more than anything in your life. You will want to find the guy who programmed them into the game and punch him in the face (and I’m sure he knows it). See the little cute flappy bird? He’s the most vicious killer you will ever meet. Now, that’s not to say it’s impossible. After getting my pride handed to me over and over I took this game as a challenge. I will beat it. 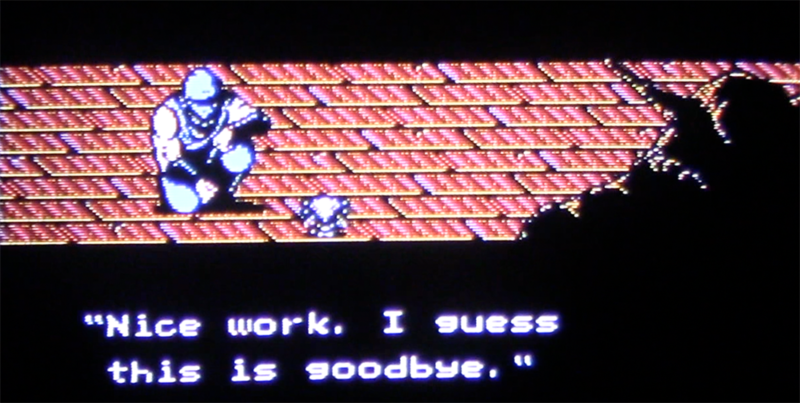 But Ninja Gaiden accepts that challenge. With hours of play I can now get to the last act without issue, sometimes without dying until act 6. Even on act 6 (at the time of writing this) I can get through it and make it to the final boss after a couple tries. 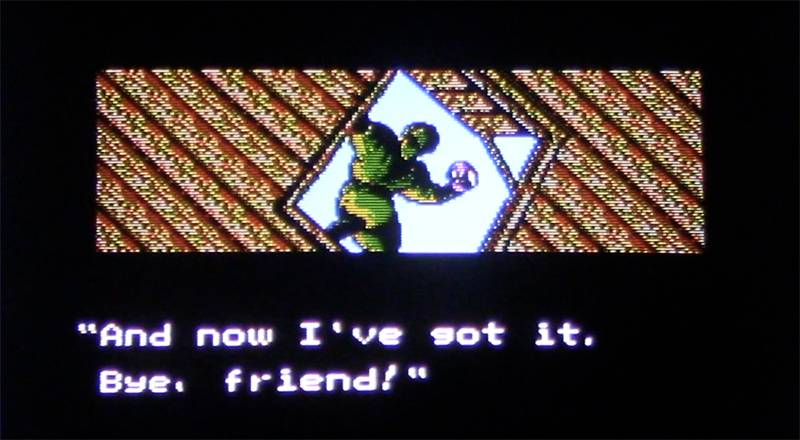 But then Ninja Gaiden has one more gut-punch for you. The last boss has three forms. Should you die, on any of them, you will be placed back at the beginning of level 6. Now you have to fight back through the three hardest sections (6-1, 6-2, and 6-3) again, just to have another shot at the boss. This makes it very hard to learn any pattern or come up with a good game plan. If the boss kills you, it’s another 5-30 minutes to get back depending on how good you’ve gotten at act 6. They do throw you the smallest of bones however. If you beat the first form of the boss and then die on the second, when you make it back to the boss you start on the second form and don’t have to fight the first again. 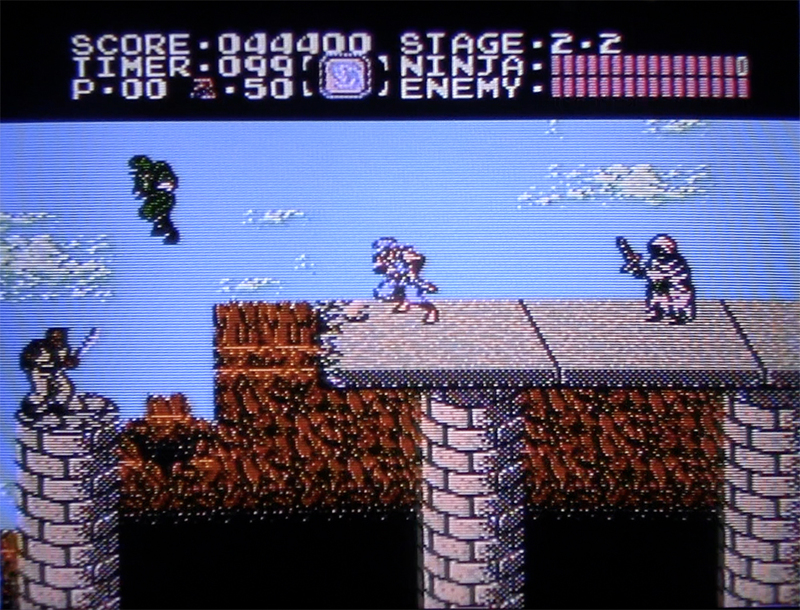 I’m going to give Ninja Gaiden a 4/5 Trogs. I really like this game. It is the perfect old-school, tough as nails challenge, that makes you want to try one more time! You will grow too angry and have to step away (and get some aspirin), but you’ll be thinking about it the next day. I am however docking it from a perfect score just due to the difficulty. I don’t mind it at all, but it will send the casual gamer home in a body bag. I hate to say it, but I haven’t beaten the final boss. When I do I will post a full run video here as a badge of honor. Until then you can see some of my early play throughs. Please excuse any rage and cussing you may hear. This Trog Vlog version was my second or so play through. I’ve learned much since then, but this is a good example of what someone tying this game for the first time will encounter. Note: I also avoided watching any videos of this game, I wanted to experience it like a true first time player.